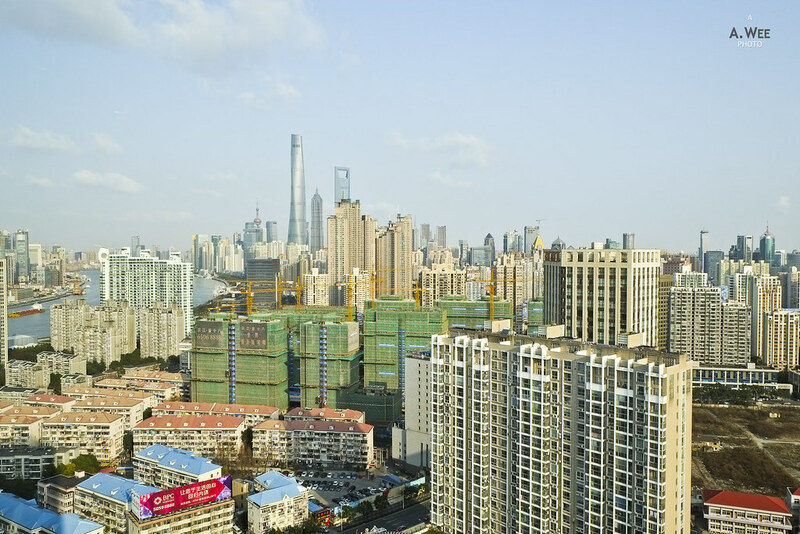 I was scheduled to spend 3 nights in Shanghai and while I was there, my business was mostly in Pudong which is the new part of town. 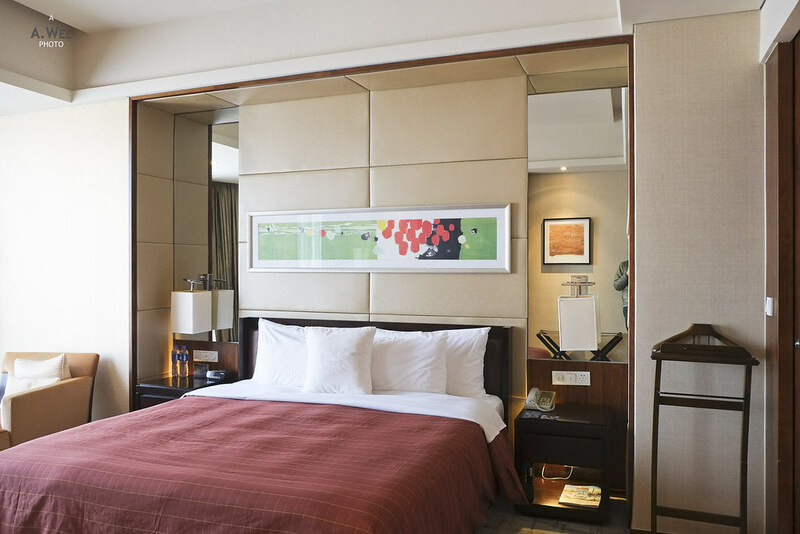 Usually I stay at my relatives’ apartments while in the city but as they were not in town, I decided to stay in a hotel and I was just a few stays away from achieving Platinum status on SPG so I decided to just hotel-hop to make up for the stays. With so much SPG options in the city, it was quite easy to hotel hop. 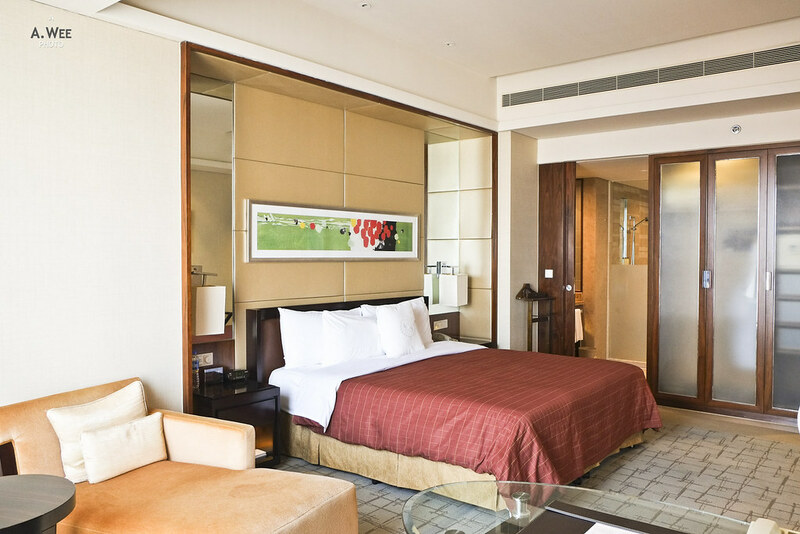 For the first night, I chose to stay at the Sheraton Grand Pudong Hotel & Residences which is close to where I needed to be while in town. I picked this hotel as it was also one of the cheapest. 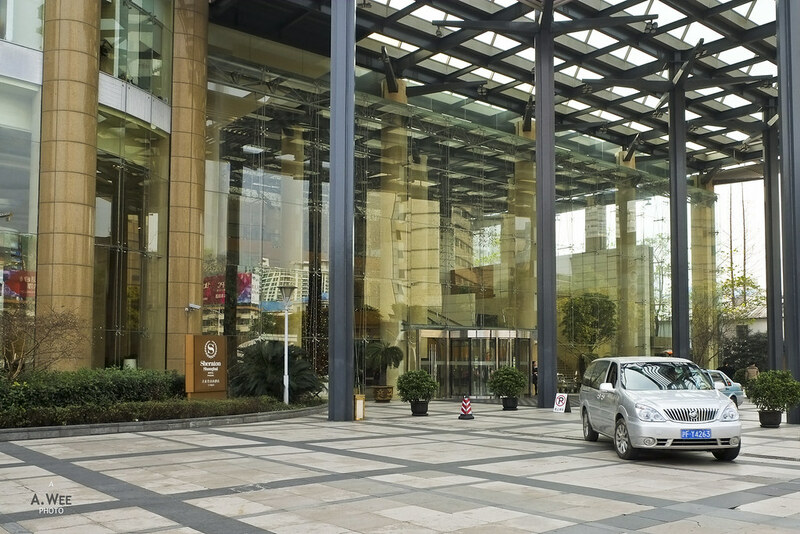 Traditionally the hotels in Pudong would be cheaper to stay while in Shanghai. It was also easy to direct the taxi driver to this hotel. 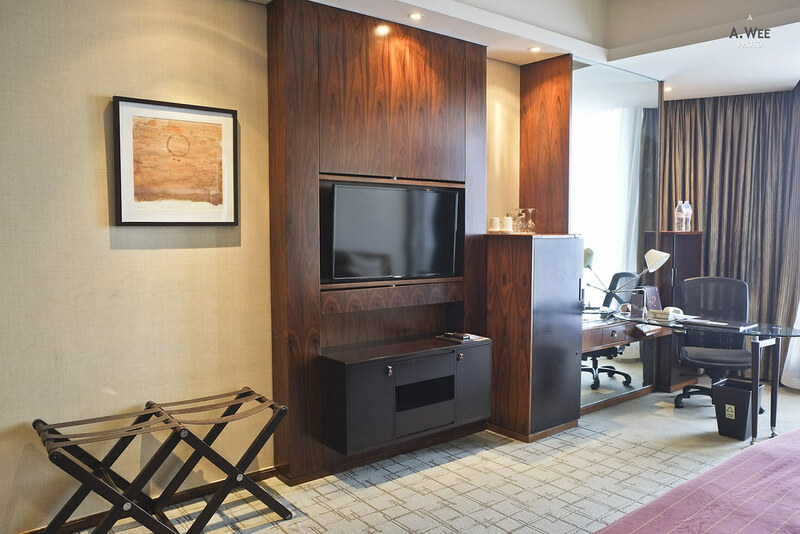 Located along Pujian Road at the southern fringe of Pudong, the hotel is also near the Tangqiao subway station on Line No. 4 of Shanghai’s extensive metro system. While not exactly prime Pudong location, the rooms here does have some nice views of the skyscrapers in the city. It is also worth noting this hotel is beside a Four Points Sheraton hotel, and both are actually owned by the same company that developed this complex. As I pull into the nice driveway of the hotel, I paid the taxi driver for the fare and retrieved my luggage, carrying it towards the reception desk. There was no bellboy to help me during this early in the morning. And further disappointment came during the check-in process as the male agent who helped me mentioned that a fee will be levied for early check-in. Now, I know the hotel was not full since this is a large property and the low fares attest to that. 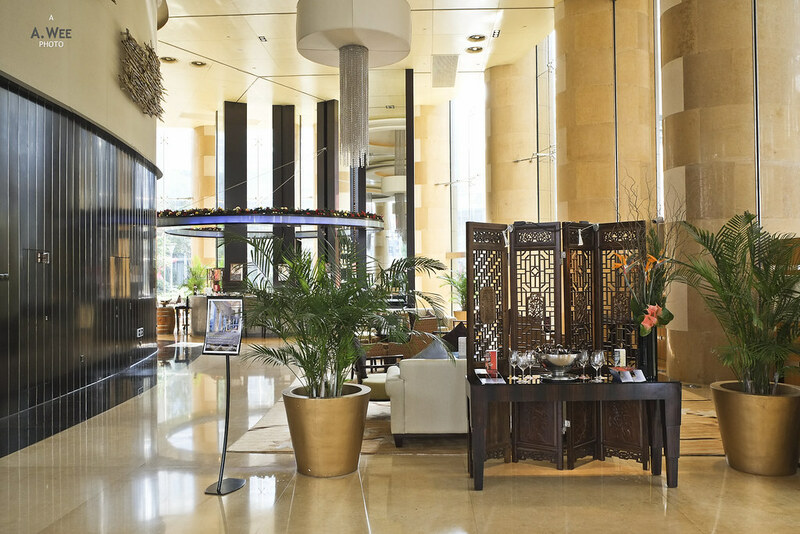 Even if I understood that hotels have a 12 noon check-in time, I usually have no problem checking in earlier at SPG properties I have been to if they have a room ready. Thus I find it in poor taste for a hotel to ask for more money to check-in a few hours earlier on the day or arrival, especially since they still provide the same housekeeping service once, which is on the next day. After rejecting the proposal from the agent, I clarified I had never been asked to pay for this on my other SPG check-ins. 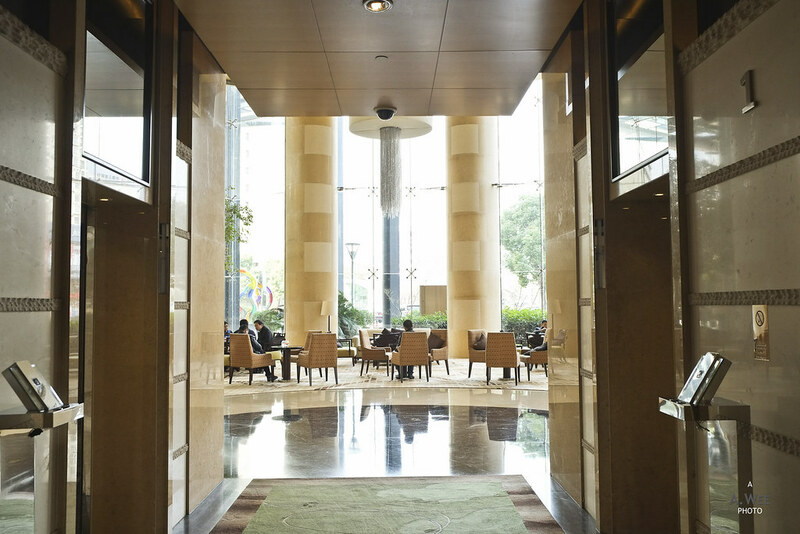 He did head back to the office to confer with the manager before agreeing to the early check-in. Though the bad experience did leave a not-so-nice first impression. Fortunately, I was provided a room close to the elevators. While I do not believe there was any upgrade to the room I booked, the standard room was spacious. The room also have a nice layout with the bathroom being accessible from two sides, one by a door near the entryway and another by a sliding door beside the bed. The centrally located wardrobe is also accessible from both the bathroom and the bedroom. Basically it was a well designed room. 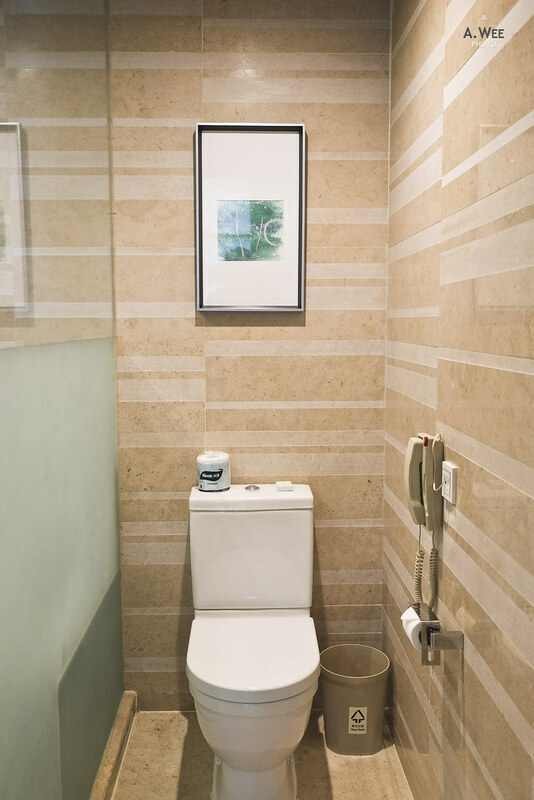 There are also separate cubicles for the shower and the toilet covered by frosted glass for more privacy. 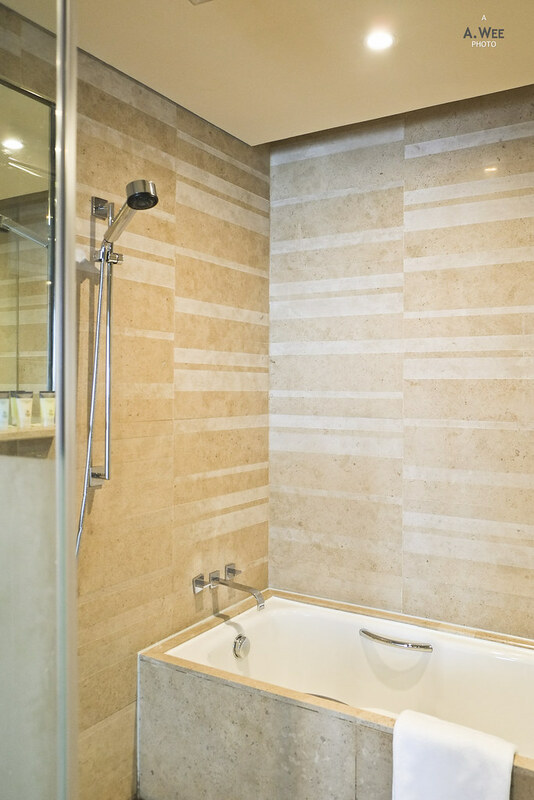 Inside the showers, there is also a separate bathtub in addition to space for a handheld shower. 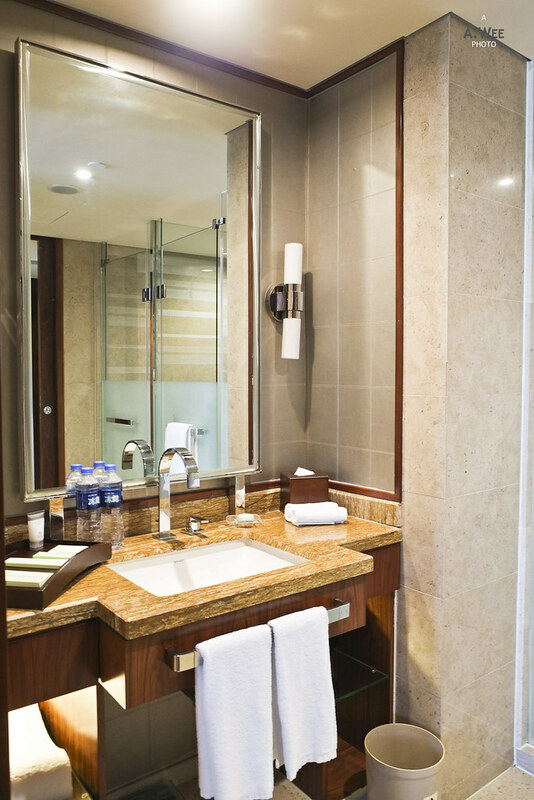 Amenities in the bathroom was not the usual Sheraton branded ones but more like a generic brand. 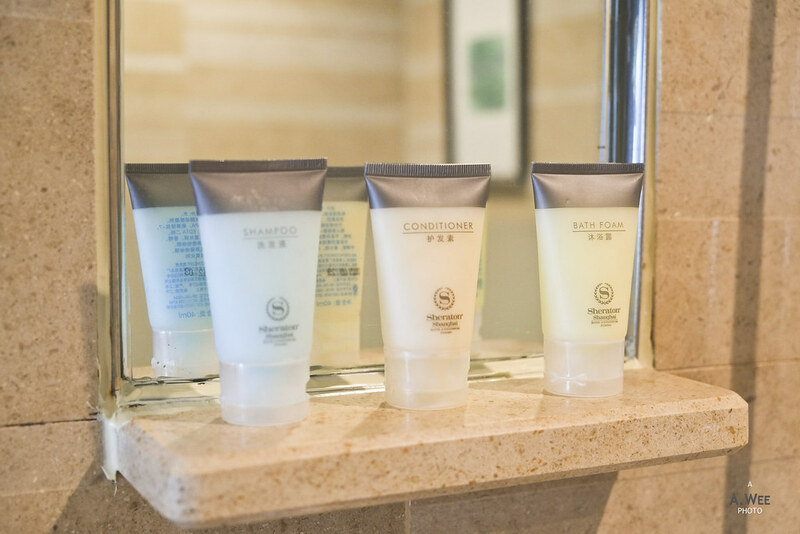 Needless to say it was nothing special and I did not use them at all as I brought my own amenities since I would be staying at a chalet later on the trip and do not expect them to provide any bath amenities. Moving on to the bedroom, there is a nice King sized bed with a coat hanger between the bed and the entrance to the bathroom. The spacious room also allowed a lounge chair/daybed to be placed beside the bed. There is a wall mounted flatscreen TV opposite the bed with a console below it. There is also a luggage bench on the side, a large minibar cabinet and a work desk by the window. What really made me like the room though was the nice view of the skyscrapers as I could see the new Shanghai Center along with Jin Mao Tower and the World Financial Center from the room. The Oriental TV Tower is also visible in the distance. The clear day that I got on the day I arrived also made this view all the better! Since I left to conduct my business in the morning after checking in, I did not really get to use the hotel’s facilities. 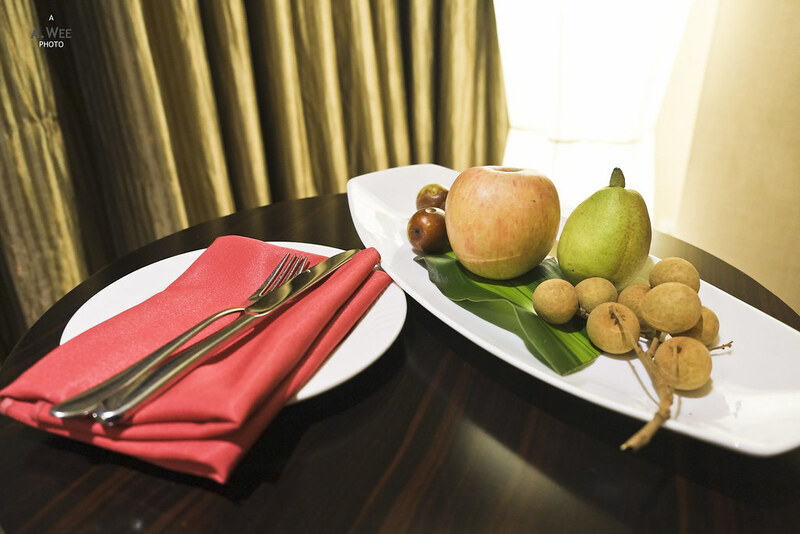 Though when I returned in the evening, there was a welcome fruit platter waiting for me. The next morning, I had some free time and was able to grab brunch at the shopping centre beside it since I skipped on the hotel breakfast as it was not included in my rate. The previous day I was also quite tired after spending the whole day out attending to my business so I woke up too late anyway. 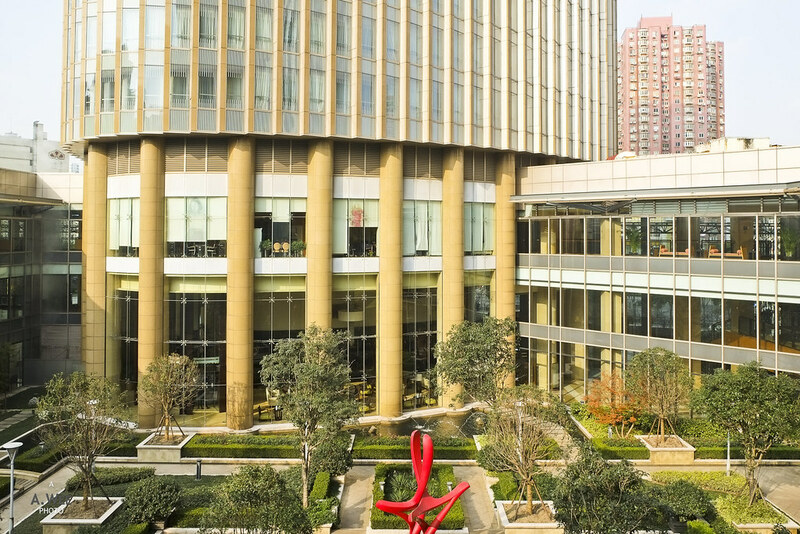 While not located in the downtown area of Pudong, the shopping mall beside the hotel made it convenient for guests staying here. Furthermore the hotel does have a full range of facility that is accessible from the hotel on the 3rd floor. 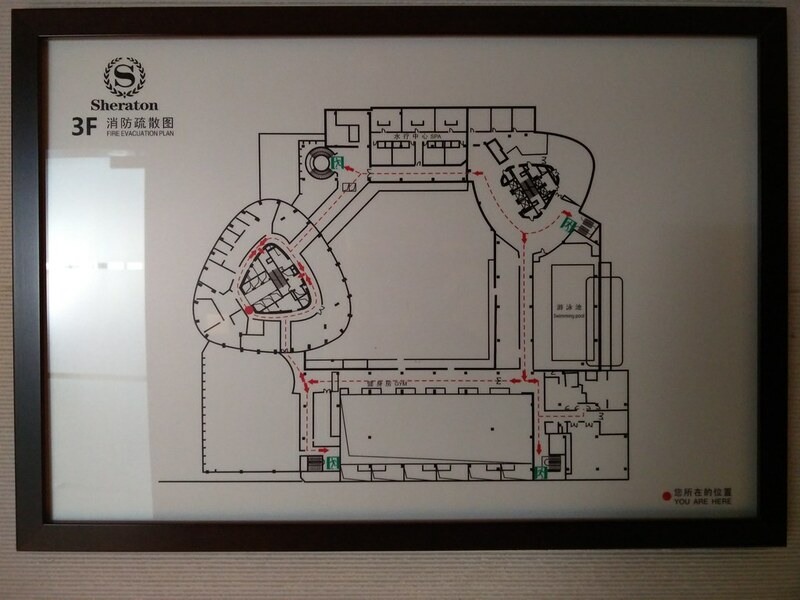 On the complex layout, the Sheraton is located under the triangular building on the upper left, while most of the facilities are located on the right side, crossing the walkway that goes around the central courtyard garden. 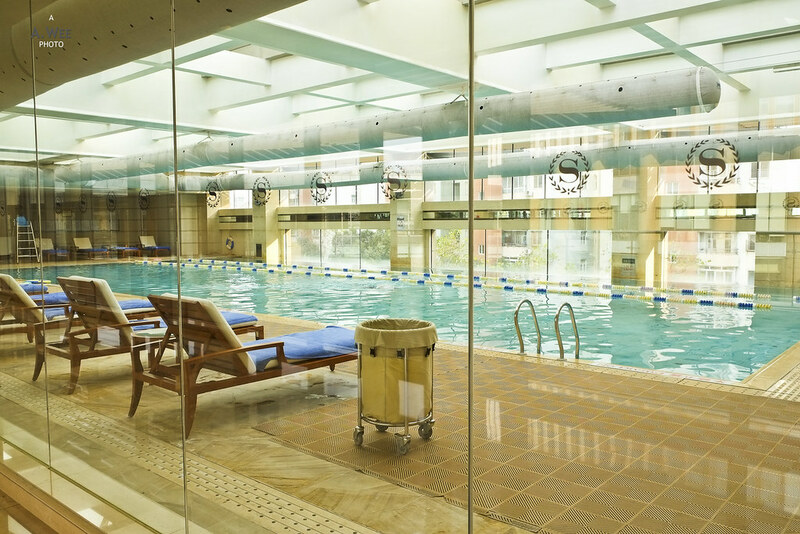 There is an indoor swimming pool which makes sense considering the cold winter in the city. Beside the swimming pool, there is a fitness centre that has glass windows overlooking the courtyard. 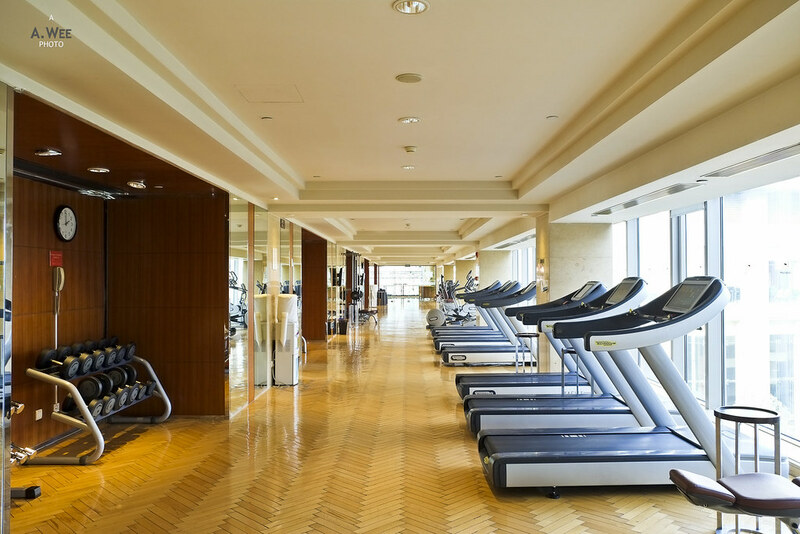 This always give it natural light which creates a very nice space to workout in. 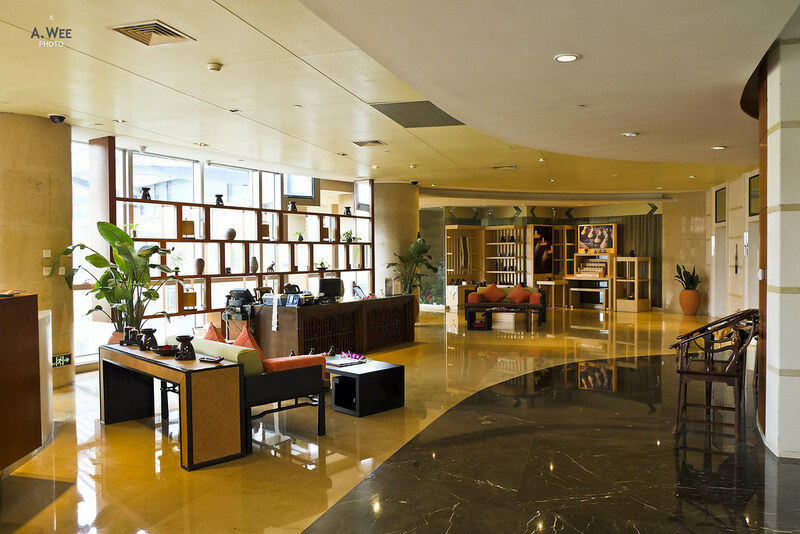 Below the other triangular shaped space lies the hotel’s spa which has a very nice reception area. This area was quite empty when I checked it out in the afternoon after lunch so it makes for a nice space to lounge in as well. 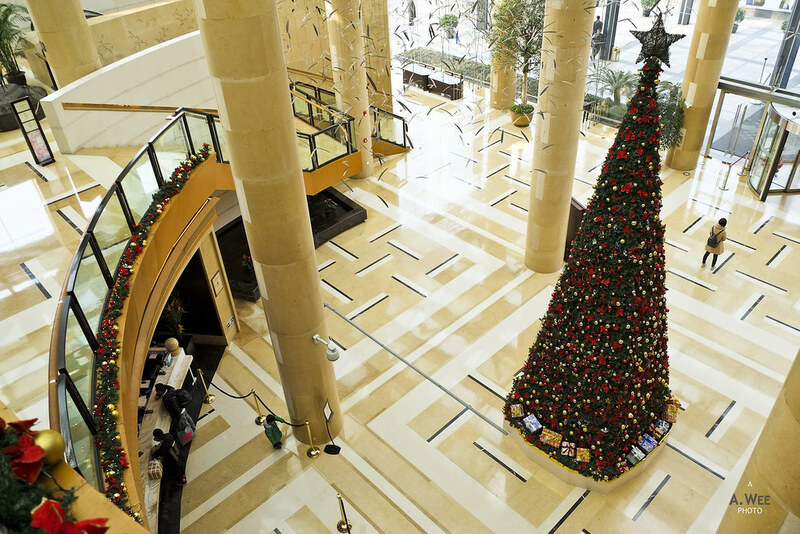 Speaking of places to sit down, there are plenty with a lobby bar as well in the grand and spacious lobby of the hotel. For this stay, I paid a rate of CNY690 (~$110), and I thought it was a great value. The Sheratons in Asia are generally very nice properties to be in and this one is no exception. Aside from the early check-in mishap, the rest of the stay was pleasant and I would not have mind staying more than one night here since the area is quite convenient to get around town from. Even at night, there are plenty of shops and services around for guests looking to explore life as a local. 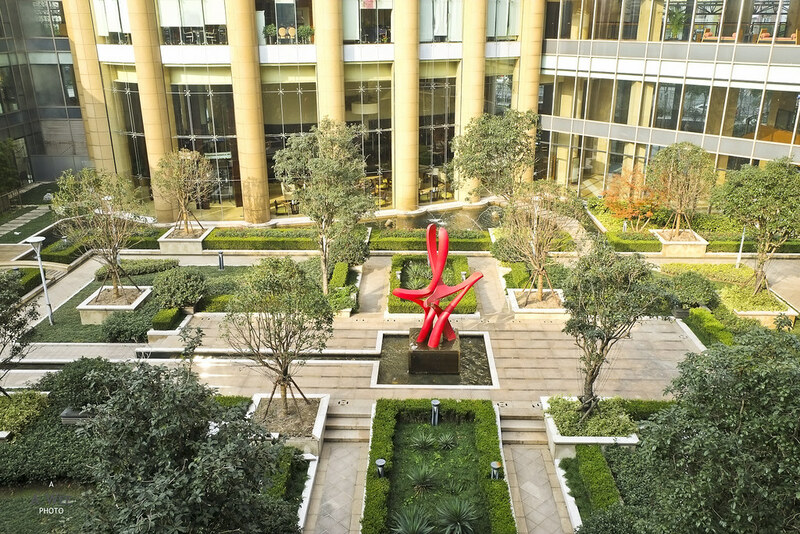 Thus, I do recommend this property for those who have business to attend to in Pudong.